LOS ANGELES, California, March 22, 2012 (ENS) – Captain Paul Watson, a Canadian-born marine mammal conservationist, is not really an “eco-terrorist,” although he has been tagged with that label by his enemies. Now he is being tagged with that label by his friends in a feature-length documentary, “Confessions of an Eco-Terrorist,” slated for release on Earth Day, April 22, 2012. Seen through the eyes of director, activist and longest serving Sea Shepherd crew member, Peter Jay Brown, the film features 30 years of never-before-seen insider footage of some of the most exciting, difficult and triumphant eco-campaigns in the world. During their voyages Watson and the Sea Shepherd crews have been engaged in conflict situations, including the boarding of ships, arrests, being fired upon by the Norwegian Navy and successfully ramming and/or sinking illegal whaling and fishing vessels worldwide. The group is also credited with stopping drift-netting worldwide and saving the lives of millions of marine animals. Terrorists kill and injure people and destroy property to attain their goals. But since the early 1970s when Watson began acting to stop the atomic testing at Amchitka and the killing of whales and seals, until today, he has not acted as terrorists act. 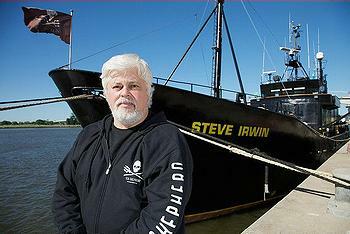 “Sea Shepherd has never committed an act of violence. We have never injured anyone. We have never been convicted of a felony,” Watson says on the organization’s website. Still, the film, “Confessions of an Eco-Terrorist,” tells an exciting tale of dedicated activists working against enormous odds to save innocent creatures. The pay-on-demand release of “Confessions of an Eco-Terrorist” was announced today by SnagFilms, a distributor of independent films for digital platforms. The film will be available through video on demand on Comcast, FiOs and iNDemand affiliates including Time Warner Cable, Cox and Bright House Networks, as well as digital platforms, including iTunes, VUDU, Amazon and Xbox Live. Brown recently returned from Antarctic waters where he was filming Sea Shepherd’s Operation: Divine Wind campaign to stop Japanese whaling in the Southern Ocean Whale Sanctuary. Whale Wars Season 5, premiering this summer on Animal Planet, will cover the voyage in detail. Click here for more information on “Confessions of an Eco-Terrorist” and to view the trailer.